Lock in a great price for Lefteris – rated 8.6 by recent guests! This place was amazing! The staff was so friendly and made you feel like you were part of their family. They arrange us to be picked up at the airport, and even meet up with us to walk us to the hotel in the rain! Front desk staff was very help in guiding us with activities to do for the day. Location was perfect and within walking distance to everything. The staff, location and the hotel was well maintained. Staff were around to answer all our questions. Property was newly updated, the view was amazing. The staff was very friendly and spoke English. It was near everything you wanted to see. The price for everything you got blew me away, great value. 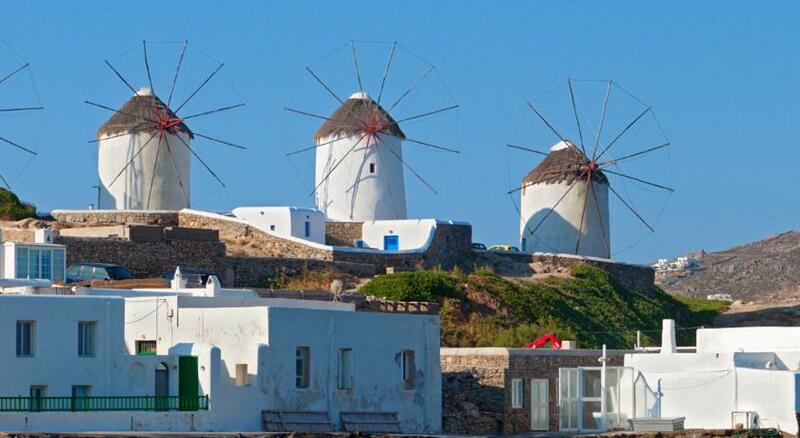 The localization is great, close to Little Venice, wind mills and restaurants. The room is new and really clean and comfortable. Staff was nice. Friendly and very helpful staff. Amazing location! Great location, fantastic balcony view, super clean, very helpful staff. Good wifi connection. Clean rooms.All good fittings.Nice balcony view.Near to restaurants. The apartment we stayed in was beautiful and modern and incredibly comfortable. 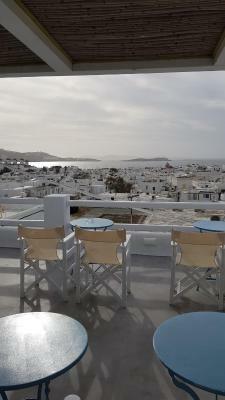 Located in a pedestrian alley of Mykonos Town, the traditionally built and family-run Lefteris Hotel offers a sun terrace and a shared lounge. It features air-conditioned accommodations with free WiFi. Mykonos Old Port is 1,000 feet away. 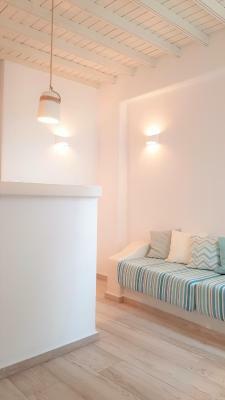 Fitted with a flat-screen TV with cable channels, all rooms of Lefteris have a mini fridge. Each comes with a private bathroom with free toiletries and a hairdryer. Some units open to a patio or a balcony with garden or town views. Several restaurants, café bars can be found 1,300 feet away. A bus stop providing connection to different parts of the island is at a distance of 1,950 feet. 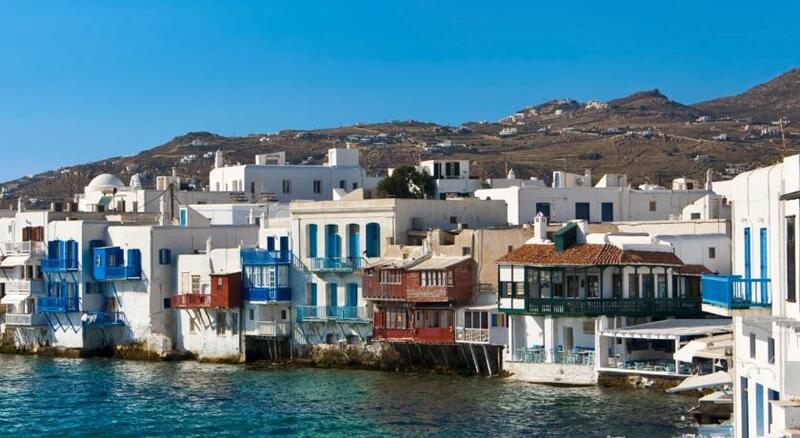 The popular Little Venice and the Archaeological Museum of Mykonos are 1,300 feet away. 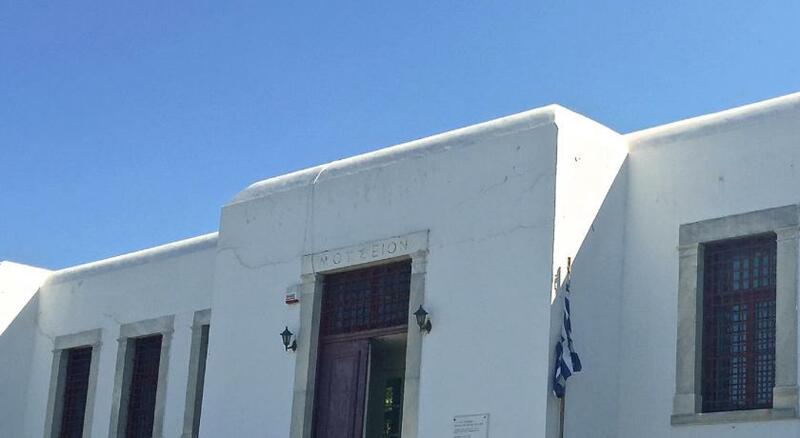 Mykonos Airport is 1.2 mi away. Public parking is available 1,500 feet away. 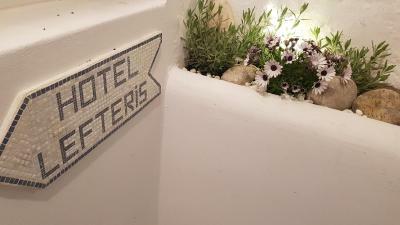 When would you like to stay at Lefteris? Fitted with a flat-screen TV with cable channels, this air-conditioned room has a mini-bar equipped with drinks and candies. Offering garden views, it comes with a private bathroom with free toiletries and a hairdryer. Free WiFi is provided. A coffee machine is also offered. Please note that an extra bed cannot be accommodated in this room type. A free coffee or a small bottle of water is offered to each guest every day. Α basket including jam, honey, butter, coffee and bread can be found in the room and its use costs 6 EUR per person. 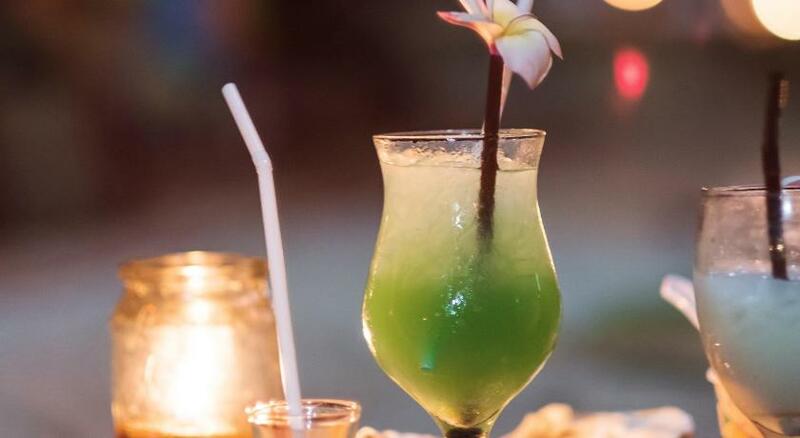 Offering a private terrace with garden views, this air-conditioned room has a mini-bar equipped with drinks and candies. Fitted with a flat-screen TV with cable channels, it features a private bathroom with free toiletries and a hairdryer. Free WiFi is provided. A coffee machine is also offered. Please note that the twin beds can be joined together to form a large double bed. Kindly note that extra bed can be provided upon request and prior confirmation from the property. Fitted with a flat-screen TV with cable channels, this air-conditioned and ground-floor room has a mini-bar equipped with drinks and candies. Opening to a patio, it comes with a private bathroom with free toiletries and a hairdryer. Free WiFi is provided. A coffee machine is also offered. Fitted with a flat-screen TV with cable channels, this air-conditioned and ground-floor room has a mini-bar. Opening to a patio, it comes with a private bathroom with free toiletries and a hairdryer. Free WiFi is provided. 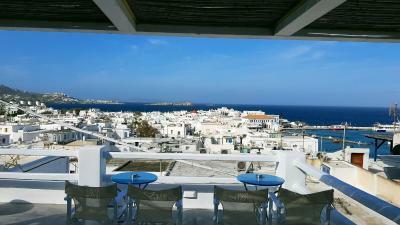 Offering Mykonos Town views from its window, this air-conditioned room has a mini-bar equipped with drinks and candies. 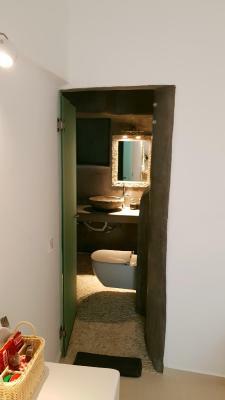 Fitted with a flat-screen TV with cable channels, it features a private bathroom with free toiletries and a hairdryer. Free WiFi is provided. Α basket including jam, honey, butter, coffee and bread can be found in the room and its use costs 10 EUR per person. Fitted with a flat-screen TV with cable channels, this air-conditioned room has a mini-bar equipped with drinks and candies. 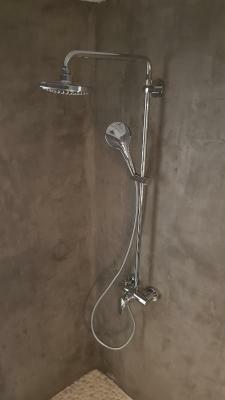 It comes with a private bathroom with free toiletries and a hairdryer. Free WiFi is provided. 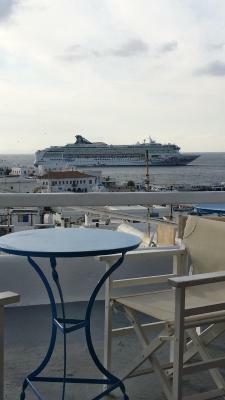 Opening to a balcony with views over Mykonos Town and the Aegean Sea, this air-conditioned room has a mini-bar equipped with drinks and candies. Fitted with a flat-screen TV with cable channels, it features a private bathroom with free toiletries and a hairdryer. Free WiFi is provided. Located in a building with Cycladic architecture in the Fabrica area, this air-conditioned apartment has a fully-equipped modern kitchen. Free WiFi and a Smart TV are available. Linen, towels and cleaning are provided. 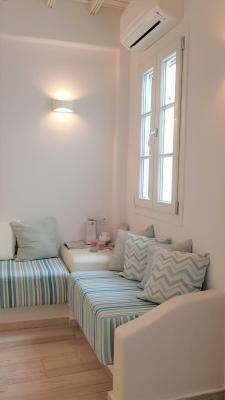 Please note that this room type is located near to Fabrica Bust Station within a 6-minute walk of Lefteris Hotel. 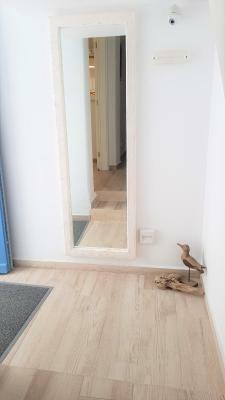 This studio is located in a building with Cycladic architecture in the Fabrica area. The air-conditioned studio has a fully-equipped modern kitchen. Free WiFi and a Smart TV are available. Linen, towels and cleaning are provided. If you are looking for a peaceful, warmth family environment and cozy rooms at the best location at the city of Mykonos with an outstanding roof terrace this is is your place. From November 2017 till February 2018 the whole building is fully renovated in order to please even more our be loved visitors ! House Rules Lefteris takes special requests – add in the next step! Lefteris accepts these cards and reserves the right to temporarily hold an amount prior to arrival. Please note that the reception is open from 08:30 until 22:30. In case you arrive outside this period, please inform Lefteris Hotel in advance of your expected arrival time. Please note that you need to climb 25 steps in order to reach the property. Please note that a baby cot or an extra bed can be provided upon request and prior confirmation from the property. 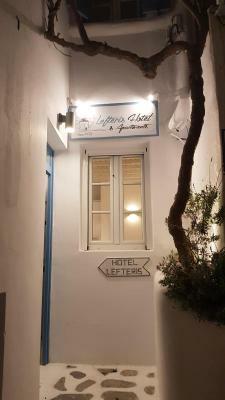 Also, Lefteris Hotel is around 2 minutes' walk from the taxi square or 8 minutes' walk from the old port of Mykonos. 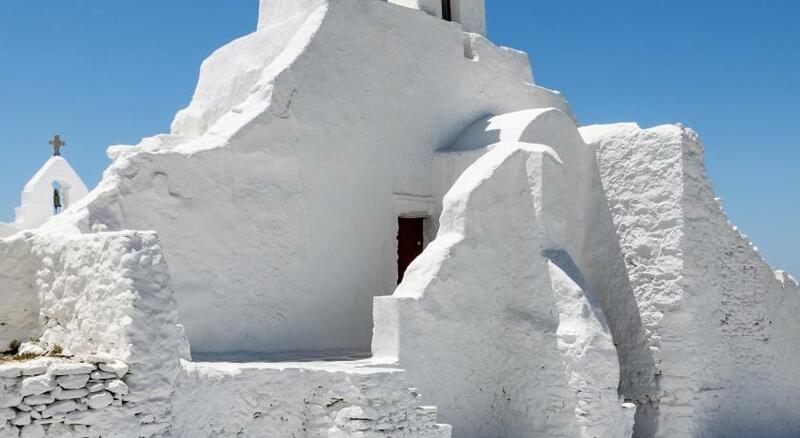 Please note that the apartments are scattered across Mykonos Town and are not located in the hotel's premises. The location is amazing, a few steps from the heart of the town. We were able to do early check in without cost, the staff was very friendly all the time and gave us incredible recommendation; at the end, they stored our luggage for a few hours. The staffs are nice and gave us many useful information. The room was clean and comfortable. Location is good too. Great rooftop patio! We had a triple room, it was simple but worked well and included a mini fridge. Easy to walk around town, including from the ferry it was simple to take a bus into town and walk to the property, and leaving the taxi stand is only a few blocks away. Location was perfect. 2 mins from old town and port. Staff incredibly friendly and helpful. Couldn't have been nicer. Rooftop terrace perfect for view of harbour and sunset. Room was totally modern with beautiful bathroom. Coffee maker and pods a real bonus..WiFi was perfect. Mr Lefteris and Ms.Kiki are very kind and helped us in everything we needed since a car to rent to a roof top where we could see the sunset. The trim had a small kitchen where you can do the breakfast and some food. The room size is good and it is very clean. The location is perfect, in Fabrika neighbourhood. It’s close to the city center and you can go on foot. There are pretty a lot steps to get hotel. It is good value for money. staff is very kind. There is great rooftop which can see sunset. The only thing I did not like was that I couldn’t stay longer. Everything: the room, the roof, the people from the hotel cannot be more charming. When I come back to Mykonos I definitely will return to this hotel. Room we were in was not within main building. Also, we booked a triple room but there were big gaps either side of the door so no privacy!